As the shocking effects of the war began to be felt, communities across the country were driven by the need to find a way to honour and remember those who served and died so far from home. Honour flags were sewn, boards of honour crafted, monuments planned and built, and even captured gun relics installed. Rolls of honour created during the war years were also used as a means of persuading people to enlist. 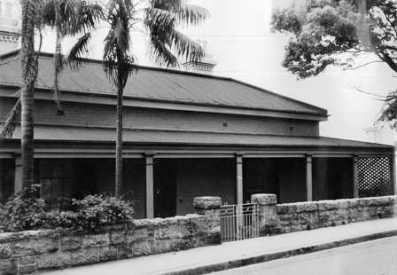 At the time, the Woollahra district was divided into three separate municipalities – Woollahra, Vaucluse and Paddington – and memorials were built in these municipalities in collaborations between the local communities and their councils. 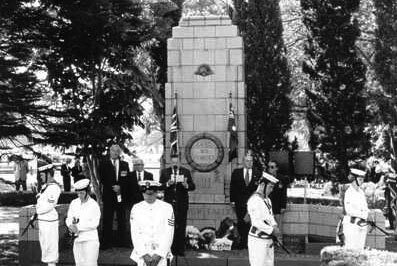 Once installed, the monuments served as an assembly place for annual Anzac Day ceremonies. A guard of honour made up of local returned soldiers welcomed the Governor of NSW Sir Walter Davidson when he unveiled the Double Bay War Memorial at Steyne Park on 2 August 1919. 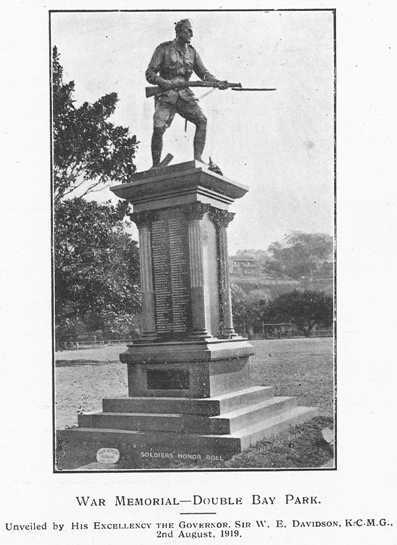 The memorial – "a striking piece of commemorative art" (Sydney Morning Herald, 4 August 1919, p.8) – featured a bronze statue of a soldier in bayonet charge, designed and sculpted by William Priestly Macintosh. The words "Freedom, Justice and Australia" are inscribed beneath the statue which was then mounted on a monumental pedestal base designed by local architect Oscar Backhouse. The names of 416 men and women who had volunteered for service were inscribed in gold on the pedestal. 64 of these men were killed or died of wounds received in action. The names of five women who served as nurses are recorded on the memorial. Sylvia Mabel Weigall, who lived at Etham Cottage, Darling Point, was 37 when she enlisted as a nurse with the Australian Army Nursing Service in August 1914. Sylvia was assigned to the No.2 Australian General Hospital and embarked on 28 November 1914, nursing first in Cairo before moving with the hospital to France in April 1916. From Marseilles the hospital moved to Wimereaux arriving on the Western Front on the eve of the battle of the Somme. Ellen McClelland of 82 Manning Road, Double Bay, had trained as a nurse at the Coast Hospital before enlisting, aged 32, with the Australian Army Nursing Service in March 1915. Ellen embarked on 13 April 1915 and joined the No.1 Australian General Hospital. Ellen was posted to Rouen (France) and was mentioned in despatches in 1919 for conspicuous service. The memorial, which gave "Honour to the brave, The Great War 1914-1919", was funded by local residents principally from Double Bay, Darling Point, Bellevue Hill and Point Piper, and was organised by a local committee (in conjunction with Woollahra Council) whose members such as the Glazebrook's and the Monkhouse's, had sons who had fought and died in the war. 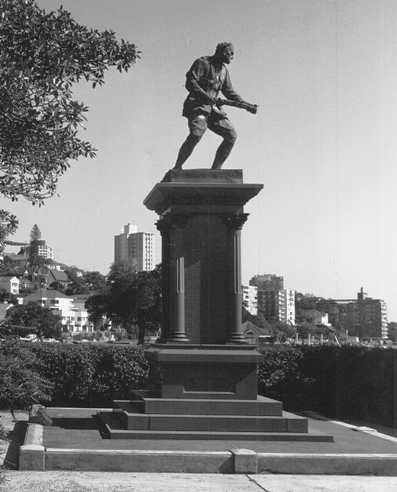 Due to concerns over the condition and future safety of the statue, in 1989 Woollahra Council commissioned the replacement of the original with a bronze cast. The original statue was transferred to the Royal Infantry Museum, Singleton. Some years after the close of the war, the trustees of the Paddington Soldier Memorial determined to build a permanent monument to local residents who had volunteered for service. In 1922, the trustees enlisted the aid of the mayor of Paddington to negotiate with the Methodist Church to obtain a piece of land for this purpose. The church agreed to the proposal and transferred a portion of its land at the corner of Oxford and Newcombe Streets to Paddington Council and a memorial was duly built on this site by the citizens of Paddington. The memorial, with the names of local residents who served in the war engraved on the pedestal base, was dedicated "in honor of the Paddington men who fought and in loving memory of those who fell during the Great War 1914-1918". It was unveiled by Sir Walter Davidson, Governor of NSW, on Sunday 19 November 1922 with the 1st Battalion providing a guard of honour and the bands of the Royal Australian Naval Reserve and 1st Battalion playing the music for the hymns. The boys just took it in their heads to go. I didn't want to stop them when they were so anxious. Of course it hurt me to part with them especially with Harold, for he was only 17 when he left. He was at the Gallipoli landing, and also at the evacuation and spent five months in hospital in England after being wounded. He's back again at the front now with his brothers and I hope they come through all right. With the widening of Oxford Street in 1940, the memorial was moved from its original location to the Oxford Street frontage of Victoria Barracks. As well as the war memorial, the residents of Paddington and the council erected other memorials in honour of those who fought in the war. 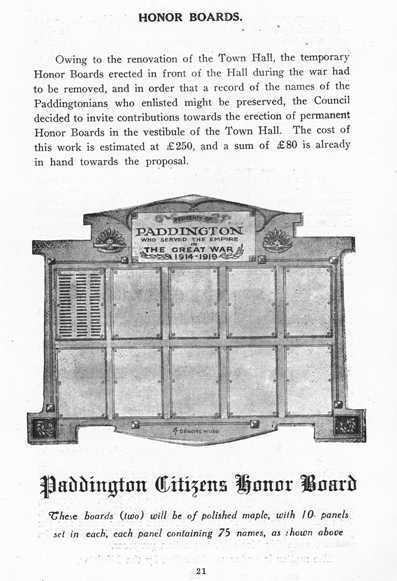 In 1916, Paddington Council agreed to a request from the Paddington Soldiers and Sailors Committee to erect three temporary honour boards in front of the Paddington Town Hall. The boards, donated by Messrs G.P Jones and Sons, held the names of almost 800 Paddington residents who served in the war. Due to renovations at the town hall in 1923, the boards were removed and a fund was established in order to finance replacement boards. Two memorials in honour of those who enlisted from the western section of Paddington were unveiled on 20 September 1919. Reported in the Sunday Times, the first memorial – "an obelisk of free stone with marble tablets recording the soldiers' names" – was installed at the intersection of Comber and Boundary Streets, while the second memorial was a column in Albion Avenue which also served "the utilitarian purpose of lighting the roadway" (Sunday Times, 21 September 1919, p.5). The memorial at Rose Bay was the last monument honouring those who fought in the war to be built in the district. 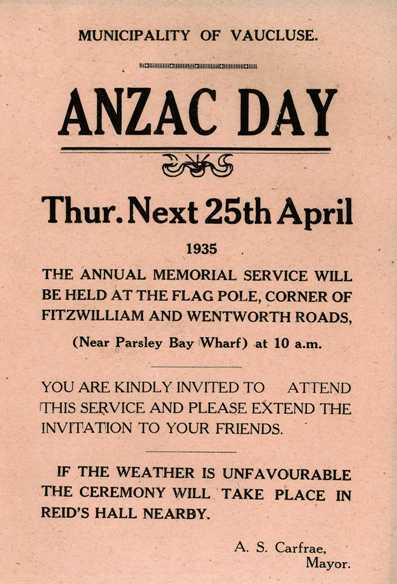 Its establishment, in 1935, was organised by the Rose Bay War Memorial Committee operating in conjunction with the local Returned Sailors and Soldiers Imperial League, with the support of Woollahra Council. The memorial was designed by local architect Reginald Prevost who proposed that the memorial be built of brick with terracotta facing at an estimated cost of £450. Once Woollahra Council had approved the plans in January 1934, the Memorial Committee set about raising funds and finding a location for the memorial. The committee eventually settled on a corner of Lyne Park on New South Head Road as a suitable site. 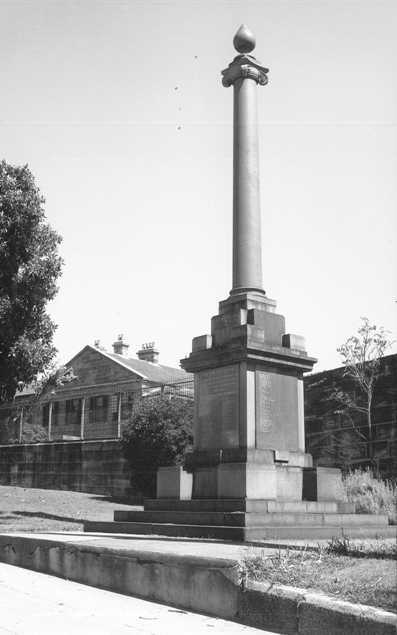 The situation for the memorial was approved by Woollahra Council and in August 1934 it was re-dedicated from its former use as public recreation to its new use as a war memorial. In September Woollahra Council was formerly appointed trustee of the site. The completed memorial was officially opened on 21 April 1935. 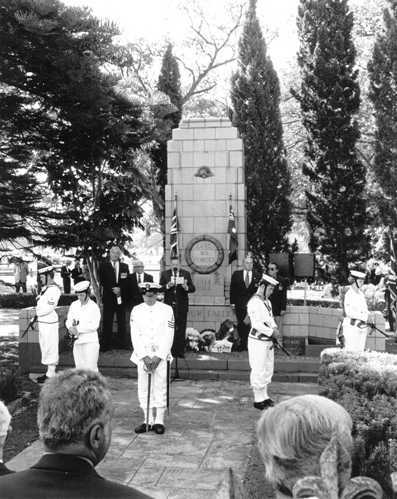 The Governor of NSW, Sir Alexander Hore-Ruthven unveiled the monument "to our fallen be mindful of the men they were". The dedication was performed by the Anglican Archbishop of Sydney, Archbishop Mowll. 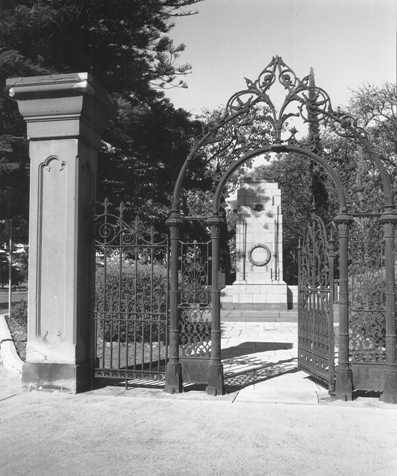 The decorative cast iron gates, a later addition to the memorial, came from the house Colebrook which stood on the corner of New South Head and Bellevue Roads, demolished in the 1960s for residential flat development. As a small close-knit community, any loss of life or injury due to the war was keenly felt in the Vaucluse municipality. In order to commemorate these losses and honour those who volunteered for active service, the council and community organised a roll of honour on which the names of those who served could be inscribed. Two honour rolls were created and mounted in the Vaucluse Town Hall in Military Road, Watsons Bay. The rolls were moved to their present location in Dunbar House when Vaucluse Council moved there in 1924. The first honour roll, donated by local resident of Hopetoun Avenue, William Taylor, was presented to the residents of Vaucluse in 1915 and the second roll, donated by Arthur Rose, resident of Twin Pines on New South Head Road, was presented in 1917. The rolls were both supplied by Hordern Brothers and each comprised a wooden board with the names of residents who enlisted for service recorded in gold. The boards were decorated with Greek style columns surmounted by a pediment with a painted motif of the Australian and British crossed-flags and the word Vaucluse. We were all saddened by the news of the death of your son, Private Roams, while fighting for his country. "Johnny" was a general favourite of all those that knew him in the Bay, and his loss will be greatly felt by a large circle of friends. His death adds another name to the list of heroes from this district who have sacrificed their lives in protecting the British Flag, under the protection of which you and I and all of us enjoy unbounded freedom. On behalf of the members of this Council, I extend to you their genuine sympathy in the loss of your boy, who died a glorious death he having "paid a soldier's debt". —Letter to John Roams, father of Johnny Roams, a painter of Watsons Bay who died of shrapnel wounds received in action in France on 2 March 1917. 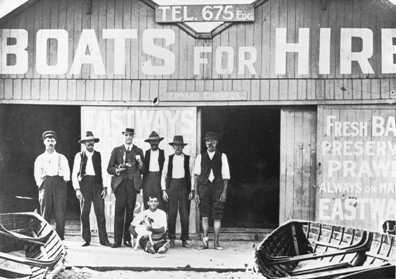 Photograph of Johnny Roams, seated with his dog, outside the Edwards boat shed at Watsons Bay, early 20th century. His father, John Roams (standing far right), came from Portugal. Johnny died at the 15 Australian Field Ambulance and was buried at Bernafray Wood British Cemetery, Montauban-de-Picardie, France. 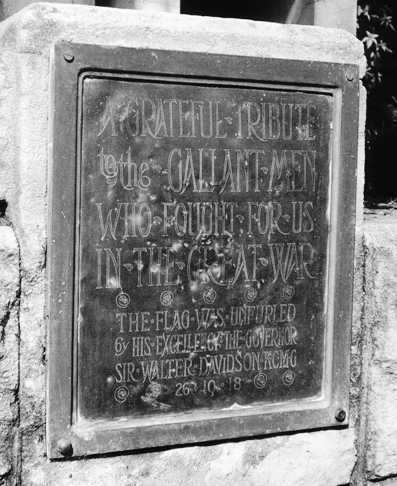 "A grateful tribute to the gallant men who fought for us in the Great War" is the heartfelt message on the memorial at Vaucluse on the corner of Fitzwilliam and Wentworth Roads. The memorial was the initiative of the Vaucluse Progress Association formed in May 1915. The Association's first years were concerned almost wholly with supporting the war effort and the loss of two of its members was keenly felt – Roy Oswald Middleton, killed by shell explosion at Pozieres on 25 July 1916, and Benjamin Digby Gibson who drowned in Egypt on 14 January 1917. Middleton was an architect who had designed a number of houses in the district, and Gibson a medical practitioner who had migrated from Ireland and settled in Vaucluse in 1914. 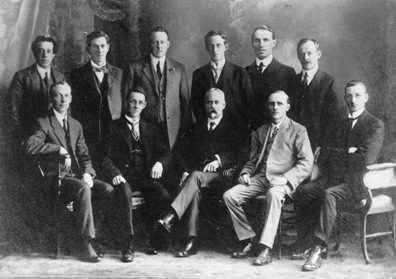 Vaucluse Progress Association Committee, 1916. Benjamin Digby Gibson, vice president, standing second from right. Members of the Association built the memorial, a 12m high, white painted flagpole flanked by 75mm bore canons on a sandstone base, in 1918. The monument marked the entrance to 'Memory Drive', a planned avenue of trees which the Association anticipated would become "an eternal reminder of our debt to our gallant men, keeping their memory green and their sacrifices in honoured remembrance" (The Vauclusian, 1919). 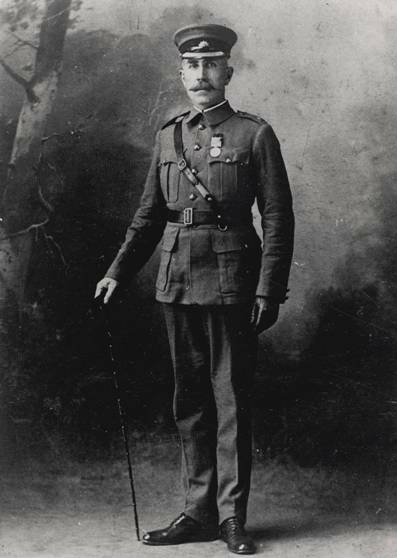 On a Saturday afternoon on 26 October 1918, Sir Walter Davidson, Governor of NSW, unfurled the flag (a Union Jack) and dedicated the Memory Drive. The deputy mayor of Vaucluse, Ald. William Williamson, also unfurled the local honour flag. The ceremony was attended by several hundred people while a band of school children "sang patriotic songs" and "flags and other bunting flew from all the surrounding homes in honour of the occasion" (Sydney Morning Herald, 28 October 1918, p.6). A commemoration service was held on each Anzac Day following the dedication of the flagpole with the first ceremony taking the form of a Thanksgiving Service for the end of the war. 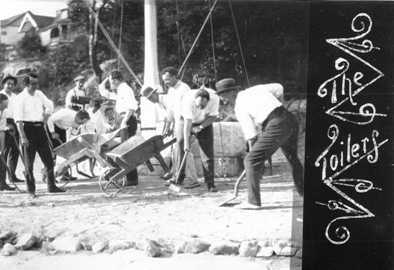 The Vaucluse Progress Association handed over the memorial to Vaucluse Council in 1925-26. See the Register of War Memorials in NSW for further description and full listing of names recorded on the rolls and memorials.